HUAQUECHULA, Mexico, May 11 2017 (IPS) - Jilder Morales, a small farmer in Mexico, looks proudly at the young avocado trees that are already over one metre high on her ejido – or communal – land, which already have small green fruit. “These were little-used lands. Now the people see that they can be worked. We seek a balance between a nutritional diet and an income, producing healthy food that brings in a profit,” said Morales, who told IPS that she starts her day as soon as the sun comes out, checking on her avocado trees, trimming her plants, applying fertiliser and making organic compost. She is a member of the “Santa Ana for Production” association in the town of Santa Ana Coatepec, in the municipality of Huaquechula, in the southeastern state of Puebla, some 170 km south of Mexico City. 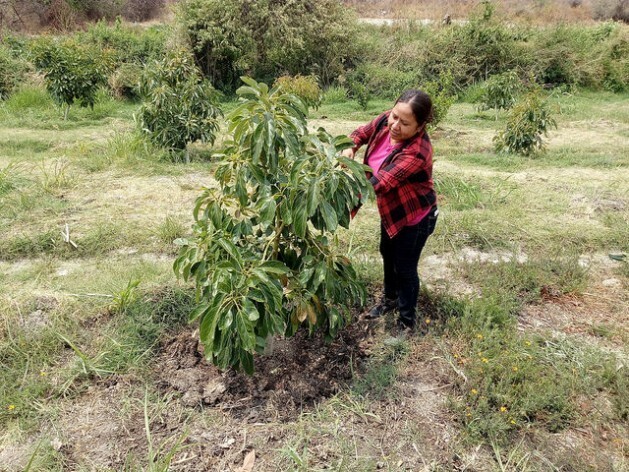 On August 2015, these small-scale producers planted avocado trees on 44 hectares of land in the ejido of El Tejonal, where 265 hectares belong to 215 ejido members. Of these, 55 are currently members of the association, which is close to achieving gender equality, with 29 men and 26 women, who play an especially important role. Each member was initially given 32 plants on the ejido, which is public land allocated for collective use – a widespread traditional system in rural Mexico. The initiative is part of Mexico´s Strategic Programme for Food Security (PESA). This programme, created globally by the Food and Agriculture Organisation (FAO) in 1994, was adopted by the Mexican government in 2002, and has been implemented since 2011 by the Agriculture Ministry together with the U.N. agency. The aim is improving agricultural production and the diet and income of poor rural families and communities, such as Santa Ana Coatepec, in order to strengthen food security and help them gradually overcome poverty. The association raises poultry to sell its meat and eggs, in addition to planting avocadoes, maize, sorghum and different vegetables. They also raise tilapia, a fish used widely in aquaculture in Mexico and other Latin American countries. Santa Ana for Production was founded in 2014, together with the Community Foundation, one of the 25 rural development agencies (ADR) in Puebla implementing the PESA, which only supports groups of small-scale farmers and not individuals. Last year, the Agriculture Ministry hired 305 ADRs in the 32 states (plus the capital district) into which Mexico is divided, to carry out the programme in selected low-income rural areas. “Women who participate have the personal satisfaction that we ourselves are producing, that we are the workers,“ said Morales, a single woman with no children. The group has been trained in fish farming techniques, agroecological practices, and nutrition, to produce their own food and to know what to eat. The first production goal is self-sufficiency, and the surplus production is sold or traded with local residents. Santa Ana Coatepec, population 1,147, was chosen by FAO and the Mexican government to participate in PESA, due to the high poverty rate. The Ministry of Social Development and the National Council of Assessment of Social Development Policies reported in 2015 that 80 per cent of the population in Huaquechula, population 26,514, lived in poverty, while 30 per cent lived in conditions of extreme poverty. The state of Puebla has the fourth largest number of ADRs, after Guerrero, Oaxaca and Chiapas – the poorest states in Mexico. María Aparicio, a married mother of three, knew nothing about fish farming, but became an expert thanks to the project, which has financed the association’s initiatives with a total of 263,000 dollars. 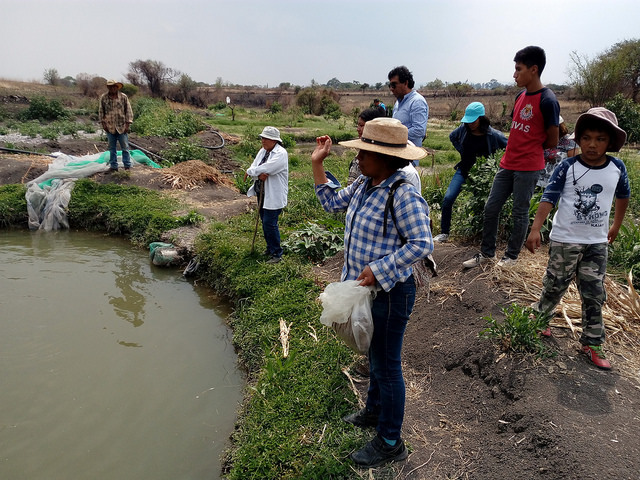 “We are creating knowledge for the region (of Puebla), for people to know how to raise tilapia,“ she told IPS. First, the association installed a tank four metres deep, with a capacity of 4,500 cubic metres of water, obtained from the El Amate spring, 1.6 km from the town. They laid a pipeline from the spring to the tanks, using the water also to irrigate the avocado trees, and maize and sorghum crops. The works took three months. The members pay 0.26 dollars per hour of water use. The association raises Nile tilapia (Oreochromis niloticus), from the southeastern state of Veracruz, and so far have produced 1.6 tons of fish. Tilapia grows to 350 grams in five months, when it is big enough to be sold. The fish farmers sell the fish at about four dollars per kilogram, with a production cost of about 1.8 dollars for each fish. In June 2016, they installed three more tanks that are one metre deep and have a volume of 28 cubic metres, to raise “Rocky Mountain White” tilapia, a light-colored hybrid breed, investing 105 dollars. But in March they produced only 90 kilograms, much less than expected. “We’re going to raise grey tilapia now. Our goal is to farm some 5,000 fish“ during each production cycle, said Aparicio, who returned to live in her town after working as an undocumented immigrant in the United States. The group created a savings fund, fed by the profits of their different undertakings, to finance and expand their projects. For Fernando Soto, FAO representative in Mexico, PESA generates “positive results“ of different types. “It is a strategy to articulate other programmes, whose coordinated actions will generate greater impacts. PESA offers productive opportunities seeking to increase food production, while respecting natural resources, and improving the diet and health of the local population,” he told IPS in Mexico City. These days, with the arrival of the first rains, the farmers have begun to prepare the land to plant maize and sorghum. Watching their avocado trees and tilapia grow, the members of the association have new hopes for their future. “We will have food security, and we will generate employment,” said Morales. “I see this and I cannot believe it. Soon all this will be full of plants and then we will harvest,” said Aparicio, looking at the avocado plantation with a hopeful expression. PESA still has a long way ahead. An internal FAO report carried out in January stressed the importance of studying the factors that affect the survival and performance of the ADRs that support farmers at a local level, not only with quantitative measurements, but also with qualitative studies. This study found that 270 ADRs do not register community promoters, 120 lack administrative staff, and 65 report no members. “A higher chance of survival for the agencies and better prospects of stability in the employees’ jobs would have positive effects on the programme´s impact,” the document says. Soto suggested promoting programmes to increase productivity in the southern and southeastern regions, strengthen the well-being and capacities of local people, contribute to preserving environmental assets, expand coverage under urban development systems, and strengthen productive infrastructure and regional connecting services.